The song “Ever Victorious Skies” was written by President Ikeda on 17th July 1978, a period in which the priesthood began to blatantly exert their authority on Soka Gakkai. President Ikeda suggested writing a “Kansai Song” at the beginning of July. The leaders in Kansai were elated. Their youth responded speedily to compose the lyrics of a song titled “Dancing with Comrades” and was sent to President Ikeda on the morning of 7th August. However, the song was not well received by the Kansai leaders as it neither reflected Kansai’s struggles nor the regretful Osaka Incident. President Ikeda, however, had plans to personally write a song as a gift to his Kansai comrades. On that afternoon, he poured his entire heart out to narrate his thoughts into lyrics for Mrs Ikeda to write down. Right from the beginning “Now, once again in a battle formation…”, the lyrics reflect his spontaneous thought of numerous unnamed Kansai comrades, together with him, creating unprecedented achievement in the annals of kosen-rufu. 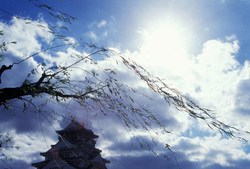 Kansai is certainly the indomitable fortress to uphold this brilliant and proud tradition. “You and me, from time without beginning, are friends who took a vow, like the melody of Spring” are words sprung from President Ikeda’s heart, depicting that the bond between him and Kansai is never coincidental. This is because Bodhisattvas of the Earth, fulfilling their vow for kosen-rufu, are bound by eternal ties. “Music of Spring” encompasses happiness, joy, advancement and victory. Apologetically, Kansai Chief said, “The first line of the second verse, ‘Our Honourable city of Golden Palace’; is it alright that we change it to ‘Our Honourable city of Jinzhou’?” “Jinzhou” was a city of strategic importance in China and also had unique and special significance to the Kansai members. In February 1956, while leading the Osaka Campaign, President Ikeda expressed his determination to achieve victory in a poem as a gift to his beloved mentor, whose birthday falls on the 11th of the month. Forever uncollapsible, Forever undefeated by devils"
Responding to his beloved disciple in resonance, President Toda replied with another poem. A Jinzhou city, I look forward with joy"
On 9th July, while attending the Kanagawa Music Festival, President Ikeda requested Sugino Yasuhiko, a youth who had experience composing Gakkai songs, to help with the melody of “Song of Kansai”. President Ikeda immediately told Sugino of his ideas and even hummed it out. At the end of the day, he listened to Sugino’s composed tune. Though lively and strong, there were areas that needed improvement. From the next day onwards, listening to the youth’s composition, President Ikeda continued to polish it. After receiving the new lyrics, Kansai members proposed to have the new song sung on 17th July’s “Osaka Day” Leaders Commemorative meeting to be attended by President Ikeda. It was on this fateful morning in 1957 when President Ikeda was released from prison due to the Osaka Incident. The Osaka Incident in July 1957 was a false allegation by the authorities against President Ikeda for influencing voters during a local election. This led to the imprisonment of him for a period of 15 days. Following that, the court case dragged on for four and a half years, before his complete exoneration by the court in January 1962. After a solemn gongyo, gift presentation and three cheers of “Banzai”, the “Osaka Day” Leaders Commemorative meeting exploded into mass singing of Gakkai songs. It started with “Kofu no Hashire” and followed by respective division songs. Osaka Chief then took the stage to announce the new "Song of Kansai" and read aloud the lyrics, followed by the unveiling of the lyrics on a banner 20 metre wide for it to be read from every corner of the hall. With renewed vow, comrades from Kansai sang their hearts out. Overwhelmed with emotions, they shed tears of gratitude as they welled forth tremendous courage. Recalling the Osaka Incident, many members gathered outside the prison to sing in the rain. They hoped to send their voices through the songs into prison to encourage the inmates. Ever since the Osaka Incident, the Kansai members vowed never to be defeated again and to emerge “Ever-Victorious”. But on this night, when “Ever-Victorious Skies” was performed at Kansai Leaders meeting, it was said that the impact exceeded the atmosphere generated at the Osaka Incident.